More than 500 people packed into Transport Public Bar in Federation Square on a Sunday afternoon to toast the best in the hospitality business. Hosted by the very funny Rhys Nicholson (who doesn’t love a free comedy show thrown in with an awards ceremony? ), the event saw ten awards given out across a range of categories. Guests were treated to delicious drinks, great food, sweet tunes from DJ Coco Brown, with a copy of the new Time Out Bar Awards issue to take home at the end of the night. Attendees were also in the running to take home their very own crystal glassware from Waterford simply by taking a snap with the Mobsta crew in the Waterford area. The snack game was strong, with Southern fried chicken, pizzas, charcuterie and cheese platters courtesy of Transport Public Bar doing the rounds. People were sipping on free-flowing Espresso Martinis on tap, Malibu Piña Coladas, Altos Tequila cocktails, Urban Alley beers, and a bespoke cocktail from Perrier. As if that wasn't enough they also got to sample Riot Wines’ wine in a can from McLaren Vale, and ciders from Hills Cider Co. 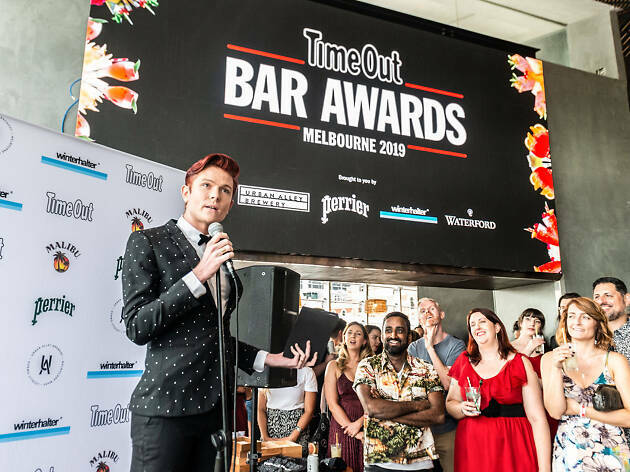 So who emerged victorious in the 2019 Time Out Bar Awards? Fitzroy cocktail bar the Everleigh was named Bar of the Year. The Everleigh is where you get the exacting standards, beautiful surrounds and whip-smart service of a high-end bar in London, but right here in the heart of Melbourne. The Everleigh is the very definition of putting our best drink forward. As well as the top gong, the Best Cocktail Bar award also went home with the Everleigh. There are shades of tapas bars, bistros and enotecas in the DNA of Kirk’s Wine Bar, but the fact that it has all three marks it as unmistakably Melbourne, and why we gave it the Best Wine Bar award. Another Fitzroy establishment, the Japanese-influenced Elysian Whisky Bar, also made a splash at the awards, by taking out the reader-voted People’s Choice Award for the second year running. People can’t seem to get enough of this whisky enclave. The Best Bar Team award went to Union Electric, whose team of bartenders is a ceaselessly energetic, tight-knit crew with a genuine bonhomie and affection for each other that spreads over and across the bar. Bartender of the Year went to Lewis Halls, the full-time advocate, educator and preacher on the virtues of Australian booze at Bad Frankie. 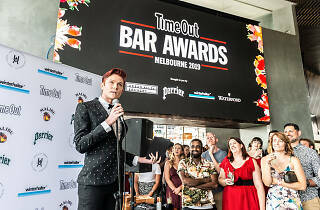 The Time Out Legend Award was given to the ‘Mother of Pearl’, Tash Conte from Black Pearl, in recognition of more than 16 years at the helm of one of the most lauded cocktail bars in the country. She’s a kingmaker in the scene. Among the bars to open in Melbourne in the past year, Clooney Kitchen and Bar, which brought the good times to Port Melbourne, was named Best New Bar. The pig’s head sandwich that went straight to the top of everyone’s hit list in 2018 ensured Congress was named the winner of the award for Best Bar Food. Designed to pinpoint a future star of the Melbourne bar scene, the Hot Talent Award, nominated by an industry panel, was given to the Gin Palace’s Jessica Clayfield. Once DJ Coco Brown started dropping the disco bangers, it was party time. Guests also took home photos and gifs from FotoBox in case those memories got hazy. Time Out thanks Urban Alley, Malibu, Perrier, Winterhalter and Waterford for making these awards possible.